The Yantra, shown in the image below has to be written on a Copper Thali with Kesar Pani[Saffron Water prepared by mixing a few strands of Saffron in a few drops of Water] using a small pointed stick. Then Kheer has to be poured into the Thali and slightly rubbed on the Yantra so that it dissolves and mixes with the Kheer. Those living in Western Countries and other parts of the World can replace Kheer with its equivalent, in their countries, like rice porridge. Then, the Kheer should be consumed by the practitioner. This Yantra Sadhana has to be performed on all the days of the Shukla Paksha [Bright fortnight] of the Hindu Month as per the Hindu Lunar Calendar. 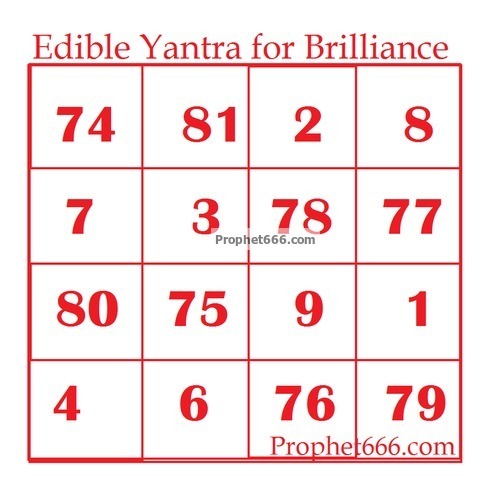 Note- as this is an Edible Yantra Experiment, it is essential to maintain hygiene, the copper plate should be clean and the practitioner should wash his hands before drawing the Yantra on the plate. Can it be done More than 1 time in Sukla paksha days. Neel sir please reply me, I need it very much. Only once on all the days of the Shukla Paksha of the month. My daughter who is 5 does not eat anything prepared with rice. Can I just pour milk on the yantra and give it to her? I have mentioned porridge as an alternative, you can sweeten plain milk with sugar. Sir, wouldn't the copper poison milk as it is known to? There are contradictory views on this, the information given here is solely based on the writings of the Tantra, if in doubt you can always consult your doctor before starting the remedy. This should be performed for one suklapakhsa is enough or we should perform every suklapakhsa? all the days of one shukla paksha should be enough. 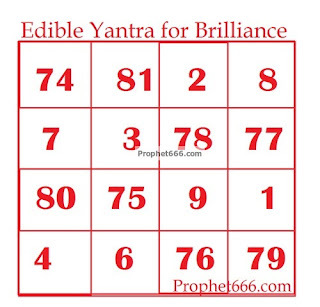 Sir, Can we prepare this yantra and do the procedure at night? as I want to do this for my brother who is deaf and dumb and doing job of a jewellery designer. Will this help him to improve his creativity skill? Yes, you can do that during the period mention in the post.